I've had some difficulty keeping in contact with custom woodworkers to get this spine made, but if a reciprocating or band saw is available (luckily my uncle had one), a flat J-shaped spine may be pieced together from a plank. 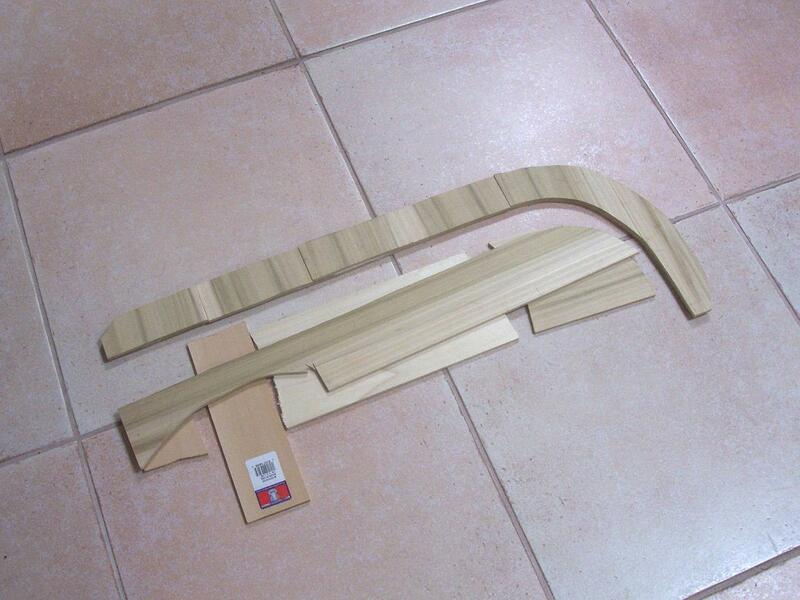 To begin with, the leather gorytos body is used to trace a cardboard pattern. The pattern is traced in sections onto a 48x6x1/4-inch poplar plank (the ones from Home Depot actually measure 5.75 inches wide). 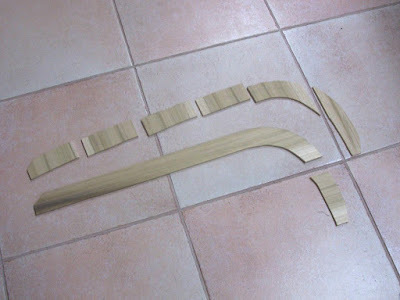 The cut pieces are to be made into a two-ply spine with the grain of the two layers running perpendicular to each other, to hopefully reduce the risk of splitting. The lengthwise-grain pieces will be on the left (outside) of the spine when the gorytos is worn on the left side of the body with the curved end pointing forward. Due to the aforementioned slightly inaccurate labeling, an extra 1/2-inch-wide piece needed to be added to the lower end of the curve on the lower face. 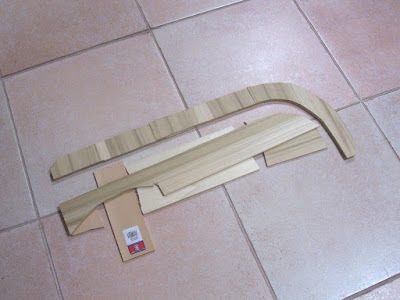 The spine is glued together with a waterproof wood glue, and placed on a flat surface to dry. Using scrap wood, half an inch of shims are placed all around it to make sure the weights sit evenly. 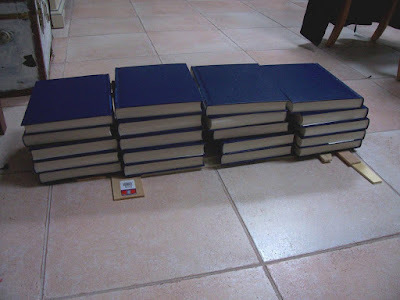 Twenty volumes of an encyclopedia form the weights to try to keep the spine completely flat as it dries. I let the spine dry for two days to be absolutely sure it wouldn't warp. Since the inside edge won't be visible, it only requires further cleanup if there are any large pieces jutting inward. The outside should be shaved and sanded if necessary to achieve evenness between the two layers; the edges can also be rounded. 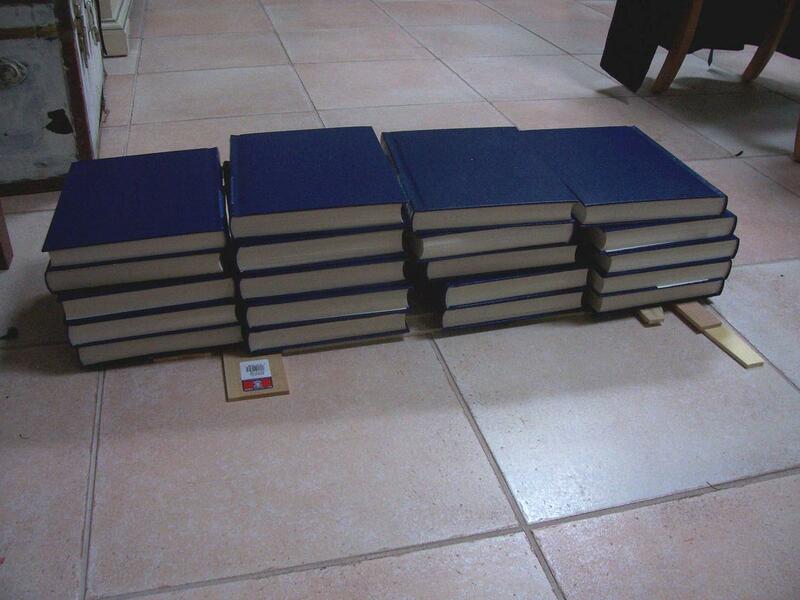 Either the floor or distribution of weights must not have been perfectly flat. Lamination failed at one point where the back layer bent away from the front. I worry that if this bit is allowed to flex in relation to the rest of the spine, it could crack. I think this is an unlikely concern, but there's no point in risking it. After the wood putty dries, the area is shaved and sanded down. Applying a modern stain may seem like cheating, as it's basically trying to make one species of wood look like a different species, but that grey and green poplar is gross-looking. Ordinarily, I would be finishing up with linseed oil at this point, but time is running very short, so tomorrow I'll apply a quick-drying varnish to protect from moisture and then get to final assembly.